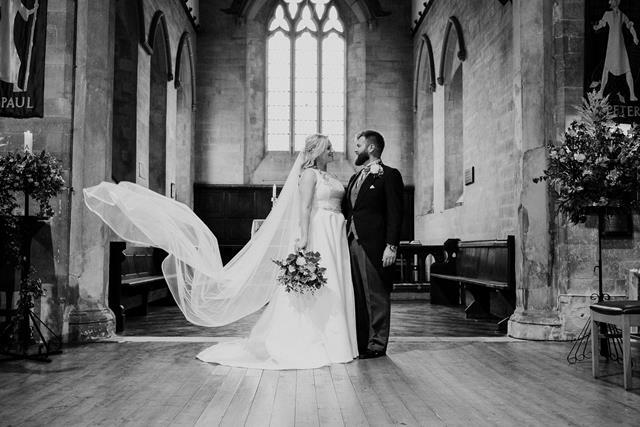 Today we are featuring our beautiful bride Kate who wore the exquisite Beatrice by Sassi Holford. 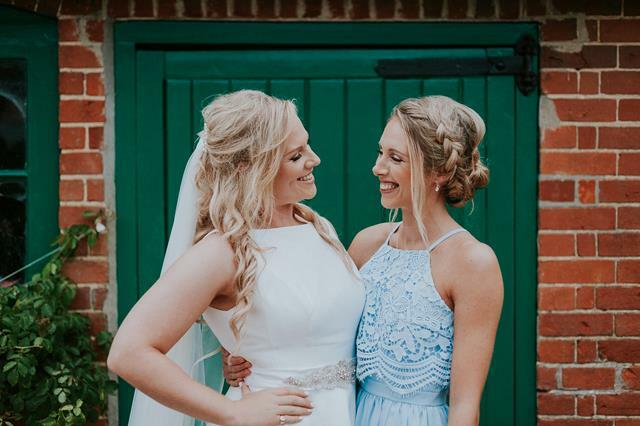 Kate married on 22.09.2018 at Strattons Farm, Kingsclere (marquee in the garden). Her photos are by Katy Tanner (Gingersnaps Photography). I was really putting off getting started on finding my dress, I felt that getting started so early (back in Sept 2017) I was in no way ready physically to start the journey, and had so many plans to get back to the gym and on the wedding diet. I was so anxious that I was going to try on so many dresses and they were all going to look ridiculous. I got started with a surprise appointment that my maid of honour Jenny arranged for me and my mum to go to. It all felt really rushed and was asked to select 5 dresses to try on, having had no guidance on what I was looking for at all. After this I decided to try a few other boutiques, about 4 other stores, with no luck at all, all of varying size stores, varying price ranges and varying levels of guidance. I finally made an appointment on a whim at BOW – it was a Sunday and didn’t expect anywhere to be open. I was in the area over the weekend on a girls weekend, and having grown up in the area but moved away, I thought it would be apt to find my dress here. 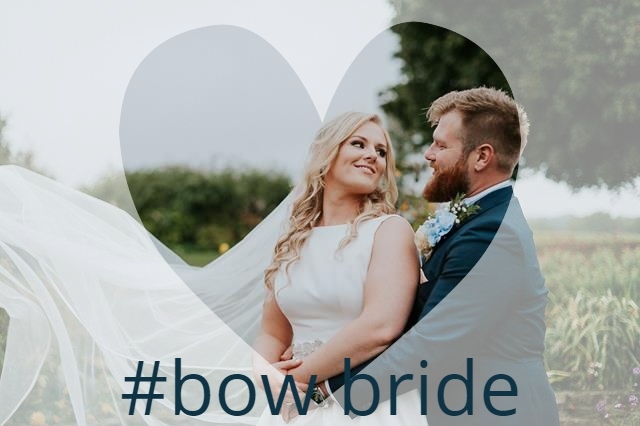 I saw that BOW had a lot more designers in stock than most boutiques and having paid for the appointment I was determined to find a dress. Laura was so wonderful, sat us down, lovely coffee and just felt so relaxed. 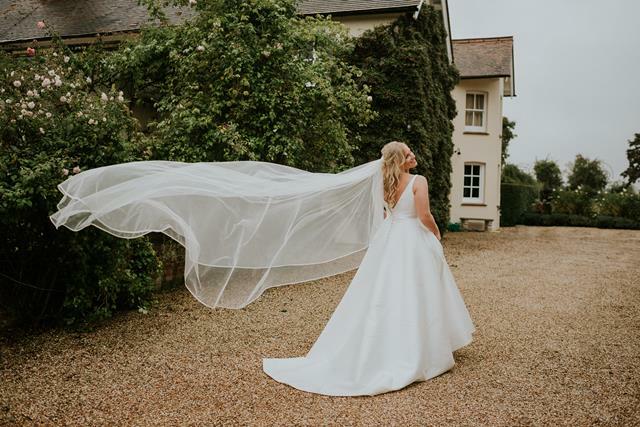 by this stage I had a fair idea that I was NEVER going to fit my backside into a fishtail gown, and that I had narrowed down that I loved a simple design with an expensive looking fabric, but was still very open to style. I think I tried 7 dresses in total at BOW and that was that – it was the first dress I tried on and just thought ‘YES’, I can actually imagine walking down the aisle in this. I had only a few appointments, selected a beautiful applique belt and had really straight forward adjustments too. It was all seamless and really enjoyed the experience. Katy has known me my whole life, our Dad’s were at school together and it was so, so special to have her capture our day. 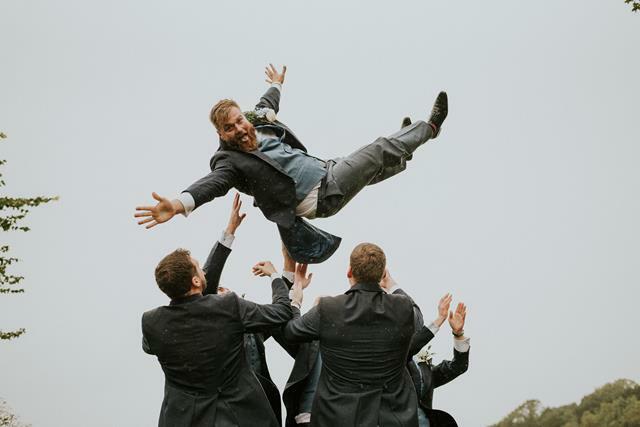 She is a phenomenal photographer and friend, and even before we go engaged Elliott and I had had the conversation about wanting her to be our wedding photographer! My Aunt really kindly offered the garden at her Farm house in Hampshire in Kingsclere where we arranged to put a marquee in the garden. We really wanted to have an earthy feel, with simple centre pieces and natural wooden features. I went Pinterest mad, I was pinning ideas for months and always keeping an eye on Ebay and other websites to see how I could create it myself. It ended up looking even better than we hoped, with all the pops of colour from the flowers. We spent 2 days in the run up to the wedding with a few of the bridesmaids, groomsmen and Elliott getting all the decorations up. I made all the centre pieces using Gin bottles that we had been collecting for months. 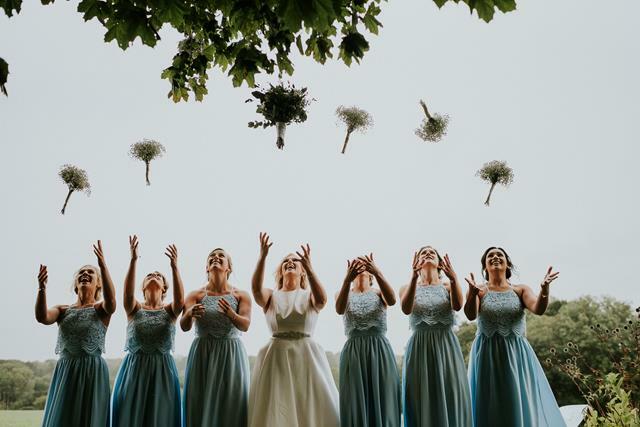 I met a wonderful florist locally to me in Woking – she had an amazing display of giant blue hydrangea balls on her stall and that was exactly what I had in mind for the flowers. 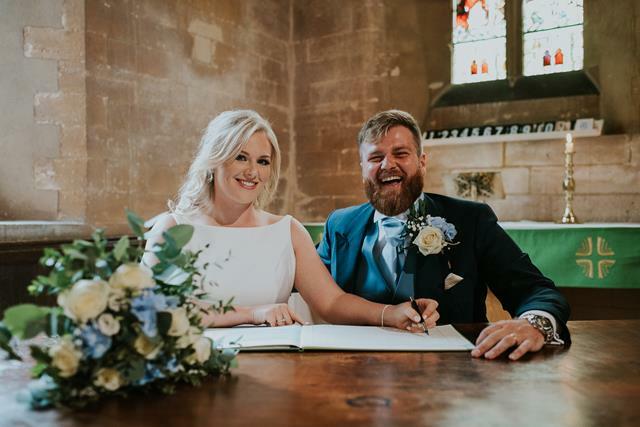 I got her card and started showing Elliott all the ideas I had for the centre pieces, he was really happy with me to run with the ideas and as I wanted to do all the marquee flowers myself it was made really simple. 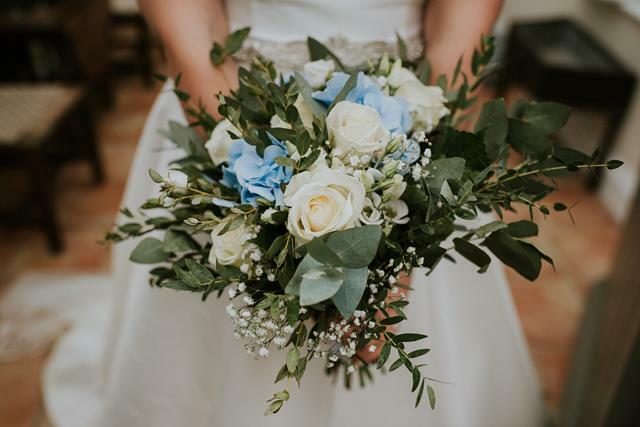 I showed some ideas to Luisa for the bouquets and she shared loads of ideas of different flowers and greenery we could include, and then it was just a matter of ordering up the loose flowers for the tables. Hydrangeas, White and pink roses, gypsophila, eucalyptus were the base for all the flowers and fake ivy for our top table backdrop. Mum and I decided to make the cake ourselves. Elliott and I had initially thought about making it and having a different flavour per layer, but decided on lemon drizzle for all tiers in the end. We did a trial run back in July and it passed the taste test with all the family. We rustled up 9 cakes and copious amounts of icing in the run up to the wedding day, icing it on Friday afternoon before the wedding and I prepped all the flowers that were used to decorate – it was all a bit of a scrambled to the end, getting it collected by the caterers on the morning and transported over to the marquee in the rain! 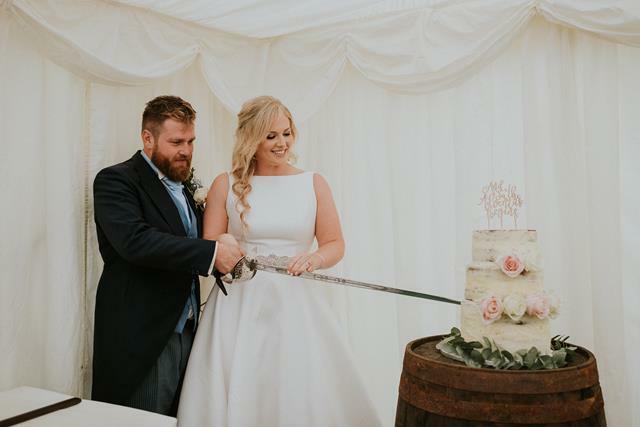 We decided to have our Cake as pudding for our wedding breakfast too, this was the best idea we could have made, there was no waste and we saved ourselves a fortune by only having to pay for 2 courses with the catering. 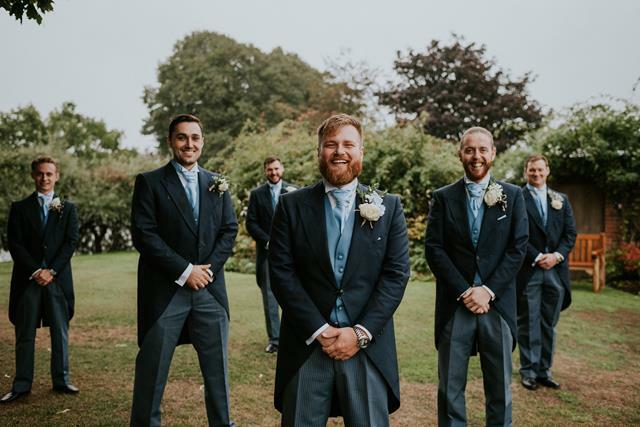 Plus – a great tip for other brides, if you are having a sit down meal, once everyone gets drinking and chatting, by the time pudding comes around, most people push it around the plate as they are too full and get a little distracted, therefore this was the most cost effective way of having a lovely 3 course meal without the extra cost. How did you feel on the morning? 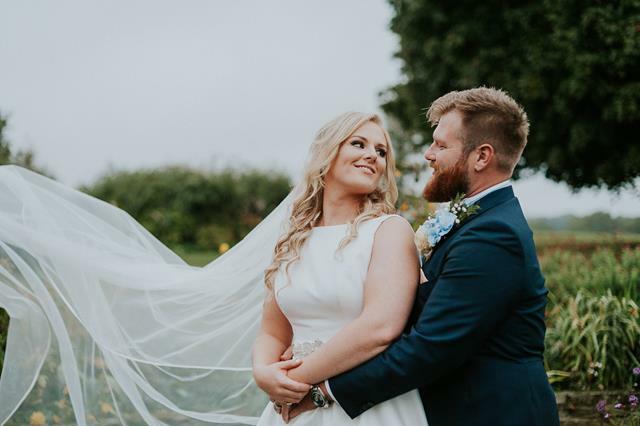 After a very early start at 5.20am when the makeup artist arrived, I didn’t have an ounce of nerves, I knew I was marrying my best friend and had all my favourite people around me! My aunt had all of my bridesmaids to stay the night before in the annex of the house. This was amazing, as everyone was all together. The girls arranged to draw straws the night before to decided who had the early slot for hair and makeup, so they were all very organised too which took away the stress. My dad was in charge of keeping prosecco on tap, and we had a really relaxing morning of being pampered with hair and makeup. 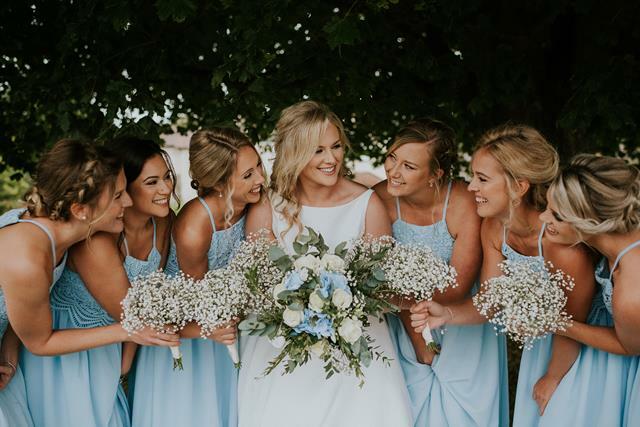 Rachel Dwan (@racheldwanmua) was a real tropper working from 5.30am all the way through to 12 getting our makeup picture perfect all by herself, and all the girls looked incredible. Tiff (@Plaitsandbuns) and Hannah (@hellohairbyhannah) came to do the hair for all the girls and it really was amazing. We ran perfectly to time and I was in my dress and ready to go before I knew it! 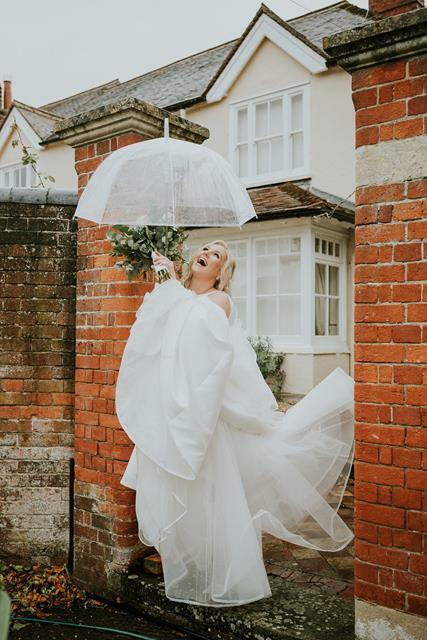 only 2 people had seen my dress throughout the whole process (my mum and my maid of honour) therefore it was a grand reveal in the morning – i’m so glad I kept it a surprise as made it so special. As I rounded the corner at the top of the aisle I was rather surprised to see that nobody had turned around to see me and my Dad walk in. I reached the last few pews in the church before I reached Elliott and he finally turned around with a big grin on his face. This really helped me in all honesty, I was so worried I was going to be a blubbering mess, having not made eye contact with anyone I was home and dry. This went really quickly, the vicar made it really personal and we had a few giggles. The vows went smoothly, and before we knew it, we were heading back down the aisle as Man and Wife! Always remember it is one day – if you are working on a budget, don’t break your back for the tiny details, only you will know they are missing! 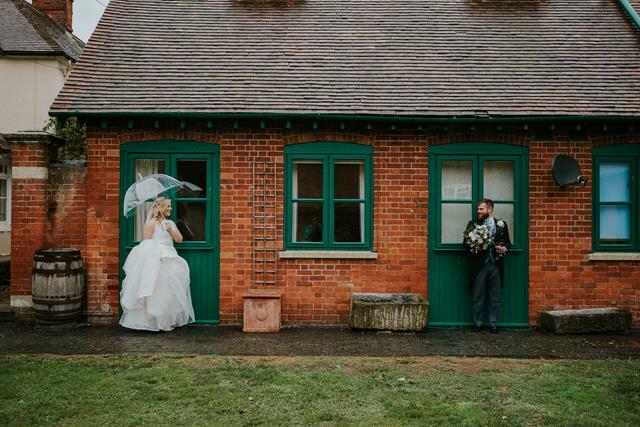 Take a break to stop and look around, and take it all in on your wedding day – this is the day you have worked hard for, planned and you don’t want to let it pass you by! 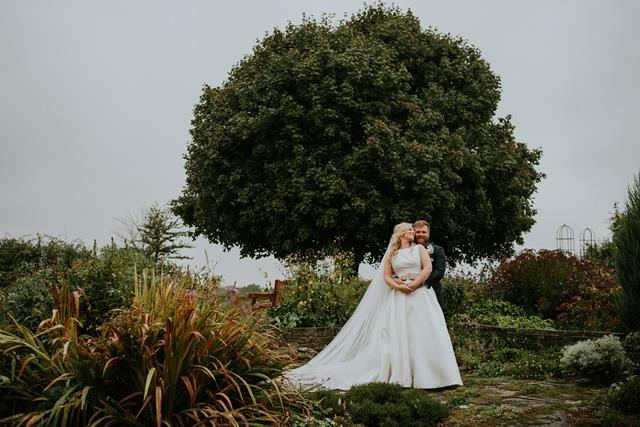 Buy your dress from somewhere that gives you the full experience – Laura made the dress buying process incredibly easy and enjoyable and this set me up for all the planning and put my mind at rest! the DJ blaring out ‘Where the Hood at’ by DMX and everyone going MAD!